Sometimes, infants are much more troublesome than children of any other ages. They are louder, they demand attention 24/7, and they are very fragile. Teenagers have their own issues, although those are related to growing into adults rather still being children and conflicts that arise from that. However, nothing of that means toddlers do not make any problems. On the contrary. Most of those problems have little to do with car seats but some of them still do. For instance, dirty seats. This happens when children kick them, for instance. A problem? Definitely. But one that can be easily solved with the help of a kick mat. Indeed, what a kick protector does is protects the seat from little footprints and any other kind of stains. They may also have some storage functions. It is not unusual for some backseat organizers to double as kick protectors, after all. The most basic feature of a kick mat is the ability to protect the back of the front seat. It is only expected. There is not too much of a variety when it comes to that. The only things that differ are the durability, the design, and the structure. However, aside from protection, there can be some additional features. One of them is storage. Depending on the model, a kick mat may be a fully-fledged protector/organizer combo or a protector with a couple of pockets or compartments. Incidentally, the latter typically perform better as a kick mat. As for those products that barely pass as a kick protector, they should be instead categorized as organizers they are. Yet another function of a kick mat is less obvious but still very important. The aesthetic function. It is a good thing if a kick mat can protect the back of the seat and double as an organizer. But if it looks pleasing to the eye and does not clash with the design of the car, it will be an even better outcome. Unlike many other items design for children riding in a car, a kick mat generally does not compromise their safety in any way. However, to every rule, there are exceptions. For a kick mat to become dangerous, a number of conditions must be met, however, it is not impossible on principle. Thankfully, it is still very unlikely and nigh impossible. To eliminate the danger completely, knowledge of it should be enough. What is this danger, then? The thing is, it is not about a kick mat as such. It is about those of them that can double as organizers, their possible contents, to be more specific. With that in mind, we do not recommend storing items that may present a danger to a child in the event of a car crash. Potentially dangerous items include glass object, objects with sharp edges, breakable items with hot contents, pointy object, and bulky hard items. Otherwise, kick protectors do not present any danger. The name is very descriptive in this instance. This is a 2 in 1 product. First of all, this is a 2-pack: you get 2 kick mats instead of just one. Just like any other item presented here. Second, the 10-inch organizer pocket each mat comes with is a perfect supplement for this type of kick protector. Even if you have no need for the organizer, you can simply flip the mat and you will get a full-size kick mat. That alone makes it simply perfect. A good way to combine features of kick mats and organizers. The fact it is double-sided like that also means that it is extra-durable. On top of that, the mat is made from 1680 Denier material, which, compared to the standard 420 Denier is more than impressive. Wear and tear should not be a problem for a very long time. The mat also cover a larger area than other kick mats, although by only 15%. Additionally, it is compatible with cars, trucks, SUVs and minivans. The kick mats from Smiinky are not only durable, large and double-sided, they also are exceptionally easy to clean, easier compared to the car seat for sure. As for the price, this may not be the cheapest product of this kind but is still very inexpensive. Add to that you get a free e-book titled “Safe Kids Are Happy Kids” as an extra, and you have a very good deal waiting for you to make it. Another 2 mat pack for a very modest price. These mats have a very specific purpose. 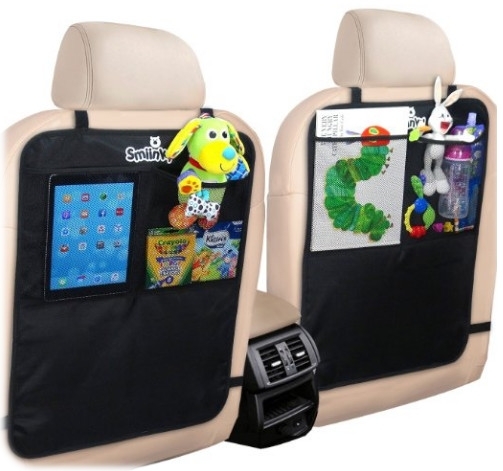 They are only designed for protecting the car seat and do not come with organizers or anything of the sort. Some people might consider it a bonus, others would not be satisfied. It is a matter of preference. However, be advised that the price is not very different from that of the mats that do come with organizers pockets. As protectors, however, these kick mats are very durable and made from premium eco-friendly materials. They will be a good purchase if you do buy it. 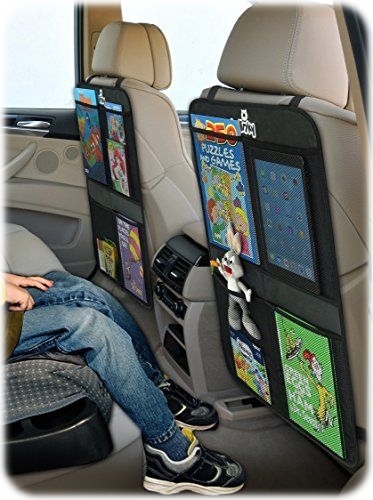 It is quite possible that you will forget about cleaning the car seats itself because that simply will not be needed as long as the Freddie and Sebbie kick mats are secured there. No scuff marks, no damaged backs of the seats. A very good solution. Another feature that is somewhat controversial is the straps. They are stretchable and it is somewhat suboptimal for the lower straps as it makes the process of installation more difficult than it could be. On the plus side, the straps do not bother the driver or the passengers who seat in the seats protected by these mats. 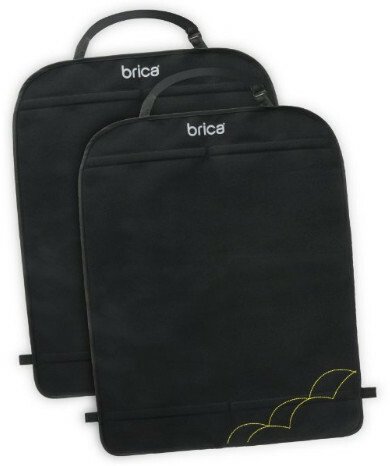 This 2 mats pack will be a good choice if you only need seat protectors and not organizer features. These extra-large kick mats also come as a 2 mat pack. No pockets or storage compartments, but the pack is almost twice as cheap as some other mats without pockets. The mats are a sure fit for most types of vehicles. Unless you have a car with relatively small seats, you will have no problems. Even if you do, the only problem will be bagginess. However, the kick mats will not protect you seat any worse just because of that. The mats are applied to the car seats with adjustable buckle attachments, which makes the process of installation very easy and convenient. That said, the straps are stretchable, which is what makes the mats such a good fit. The combination of elastic materials and buckle attachment takes the best from both types of car seat protector installation. The mats are a good protection against moisture thanks to the grime guard fabric. You do not have to worry about fluids soaking through it. Everything has been thought and taken care of. The mats have been thoroughly kid-tested. The words “child-resistant” may sound like a joke to some people but this is what this product truly is. If you have very active children and want to protect the car seat from their not so clean footwear, these mats will be up for the task. This 2 mat pack is a good choice if you want to have an organizer and car seat protection without paying too much for that. That said, the mats are made from the standard 420 Denier. That means they are not extremely durable but they are still durable enough to offer a decent level of protection. The mats are rather large, 18×24 inches, and cover the entire back of the seat. This is more than enough for protection against scuff marks and things like that. Let us also not forget about the fact the material of the mats is water-resistant. Not only does it help to protect the seat from wet feet and mud, it also makes cleaning the mat less of a torture, to the point it cannot be called torture at all. A damp cloth will suffice and if you want to be more thorough, the mats are machine-washable. 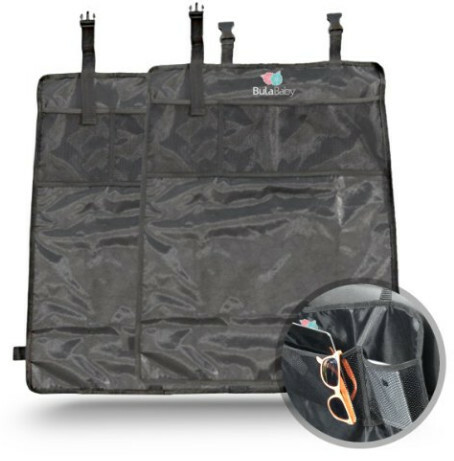 The organizer feature is nothing special but it can be quite handy for those people who appreciate that, although we recommend that you purchase a car seat organizer proper if that is the case. Some of them do have the properties of a kick mat and can easily double as protection. The mats are also very easy to install and can fit most seats regardless of the type of the vehicle. A very good purchase. Enovoe is a rather well-known family-owned company, on par with such brands as Britax, Maxi-Cosi, and Cosco. It is little wonder their products meet the needs of so many parents and children. After all, the creator of all those products are parents themselves, and they know exactly what children and parents need. Kick mats certainly fall under this category. 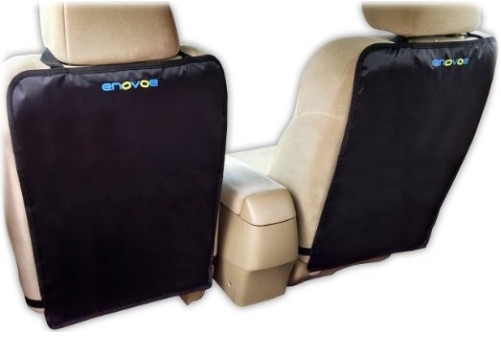 The design of these mats—the Enovoe mats, too, come in packs of two—is universal and suitable for most types of vehicles, does not matter if it is a car, an SUV or a truck. The elastic straps are easy to adjust although the bottom strap might be a little bit loose on some seat. Even then, the passenger feels no discomfort since the strap lies tightly enough on their side. And that is what matters most in the end. The mats are more than simple protection. They are also very stylish, and the importance of style should not be underestimated. Moreover, premium materials used in the mat construction are also very durable. They are waterproof and easy to clean as well. In this instance, a damp cloth is all you will need. No machine washing. 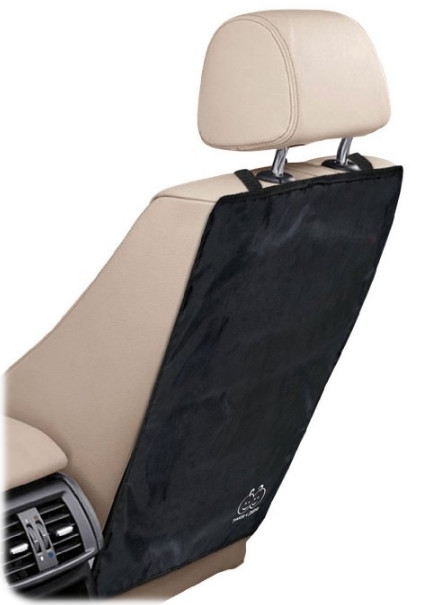 Not only do the mats protect the seat from scuff marks, snow, rain, mud, and dirt are no longer a danger as well. You can get all this for a really modest price.